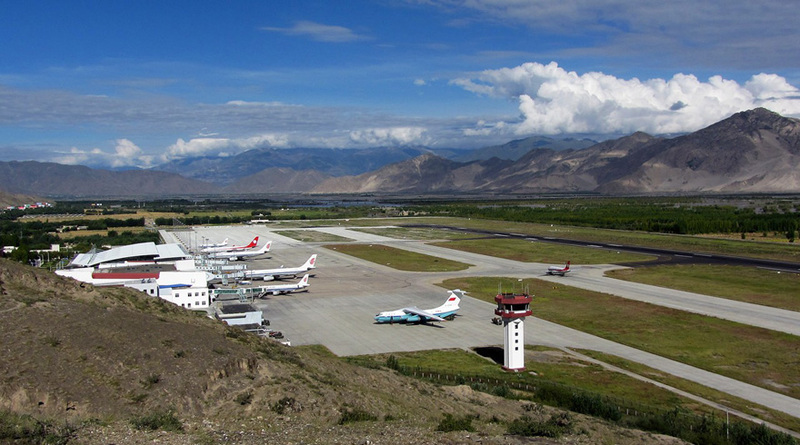 (TibetanReview.net, Oct04, 2018) – China has built underground bomb-proof shelters to house fighter planes at the Gonggar airport of Tibet’s capital Lhasa in apparent preparation for possible conflict with India, which it considers realistic following the tense, drawn out Doklam standoff last year, according to a hindustantimes.com report Oct 3. The airfield, earlier meant to boost “regional connectivity”, is now being turned into a military airbase, the report said, citing three unnamed officials familiar with the development. The report cited one of the officials as saying a “taxi track” from the airstrip leads to blast- or bomb-proof hangers dug deep inside the mountains nearby. The three officials have been cited as saying the underground facility can hold around three squadrons of fighters or about 36 aircraft. The People’s Liberation Army (Air Force) has such facilities along its border with Russia and the underground bomb-proof facilities along the India-China border in the Tibet Autonomous Region (TAR) is a “new development,” the report cited the third official as saying. Besides, the officials have been cited as saying, there are Surface-to-Air Missile (SAM) bases near some of the airfields that are being augmented and expanded along with helicopter bases. For instance, the SAM base near the Shigatse airfield situated across Sikkim has also been augmented, it was stated. During the Doklam crisis last year, troops of India and China engaged in an extended stand-off lasting 73 days. During that period China’s official media repeatedly taunted India and called for war to teach New Delhi a lesson. It eventually ended after hectic diplomatic parleys, with the two sides agreeing to withdraw from the site. Relations between the two countries have warmed in recent months with the Indian Prime Minister Narendra Modi visiting Wuhan for an informal summit with Chinese president Xi Jinping where the two leaders committed to improve ties.